Ten years ago, when all hell was breaking loose in the economy, our team was volunteering their time to do the branding and marketing necessary to raise money for a non-profit called Engineers in Action. Engineers in Action had a plan to raise money for the necessary wells and infrastructure to provide clean water and sanitation for over 2,000 families in Bolivia, where 1 in 5 children were dying before the age of five. The answer became clear as the water now giving life to the people of Bolivia. Aqua Vita Creative was born of that moment of inspiration, and our mission remains the same today: to be the Water of Life to those extraordinary people and businesses we choose to work with. Ten years later, we still carefully select the best people, products and organizations to represent and have served hundreds of businesses in countries all around the world. 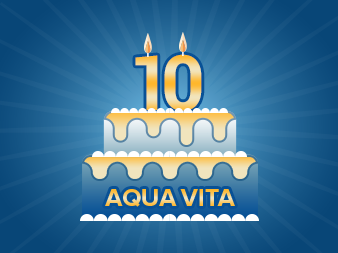 Aqua Vita Creative continues to function debt-free, and we maintain a perfect record in our reviews and BBB listings. Thank you to our team, our clients, our partners, and everyone else who has made this an incredible journey. Next Next post: 4 Disciplines of Execution, Week 100!